After you locate an app you want, the next step is to download it from the Google Play Store into your Samsung Galaxy Note 3. The app is installed automatically, building up your collection of apps and expanding what the phone can do. Find the app you want and open its description. The app’s description screen looks similar to the one shown on the right side. The difference between a free app and a paid app is found on the button used to obtain the app. For a free app, the button says Install. For a paid app, the button shows the price. You may find three other buttons when viewing an app that’s already installed on your phone: Open, Update, and Uninstall. The Open button opens it; the Update button updates it; and the Uninstall button removes it. Touch the Install button to get a free app; for a paid app, touch the button with the price on it. The next screen describes the app’s permissions. The list isn’t a warning, and it doesn’t mean anything bad. It’s just that the Play Store is informing you which of phone features the app has access to. For a paid app, you may have to choose a method of payment or input a new method, if one isn’t on file. Choose a credit card, if you have one set up with Google Wallet. If not, you can input credit card information per the directions on the screen. For a paid app, touch the Buy button. The Downloading notification appears atop the screen as the app is downloaded. You’re free to do other things on your phone while the app is downloaded and installed. Or, if you were doing something else while the app was downloading and installing, choose the Successfully Installed notification. The notification features the app’s name with the text Successfully Installed beneath it. After you complete the initial app setup, or if no setup is necessary, you can start using the app. 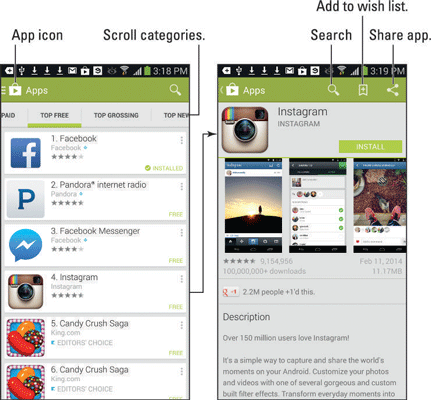 Apps you download are added to the Applications screen, made available like any other app on your phone. When you dither over getting an app, consider adding it to your wish list. Touch the Wish List icon when viewing the app. You can review your wish list by choosing the my Wishlist item from the Play Store app’s sidebar. Some apps add shortcut icons on the Home screen after they’re installed. For a paid app, you receive a Gmail message from the Google Play Store, confirming your purchase. The message contains a link you can click to review the refund policy in case you change your mind about the purchase. Be quick on that refund: Most apps allow you only 15 minutes to get your money back. You know when the time limit is up because the Refund button on the app’s description screen changes its name to Uninstall.